CHICAGO—Not mincing words, the Honorable Minister Louis Farrakhan issued a direct challenge to those members of the Jewish community and others who continue hurling false and erroneous charges that he is anti-Semitic. 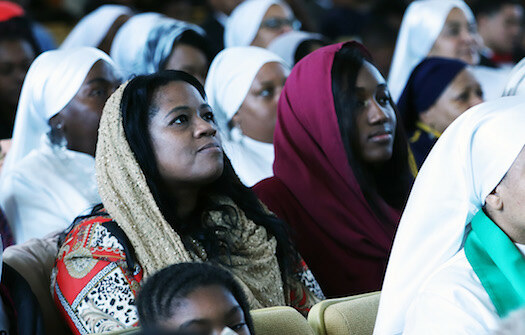 The Minister addressed those accusations and discussed his recent trip to the Islamic Republic of Iran and other topics while boldly declaring that the Nation of Islam stands on a foundation of “invincible truth,” during a two-hour address in front of a capacity crowd Nov. 18 from the Muslim movement’s headquarters at Mosque Maryam in Chicago. “Those of the Jewish people who want me dead, there’s a way you can do it; because my teacher said he was willing to give his life if one word that he taught was false. And I’m willing to offer my life for the word that I teach from the Honorable Elijah Muhammad. You want me dead? Prove that I have lied, and I will offer you my life. But will you offer me yours?” Min. Farrakhan stated matter-of-factly and with the confidence of a man who has worked tirelessly for over 60 years in the mission of his teacher. Since the early 1980s, when he came to the defense of and provided protection for Rev. Jesse Jackson—who was running for president of the United States while receiving virulent opposition and even death threats from Jewish groups during his campaign for the Democratic nomination—Min. Farrakhan has been accused of being anti-Semitic for daring to criticize and point out wrongdoings of those in the Jewish community whose actions have harmed, interfered with or taken advantage of Black people. The attacks on Min. Farrakhan from that point have never ceased and have increased exponentially since the beginning of this year. White and Jewish political commentators, media personalities, celebrities and conservative and progressive pundits have increased pressure on their Black counterparts, demanding they disavow him and exercising their unrelenting need to maintain power and control over the affairs of Black America. “If we prove you to be the liars will you offer your life? Not that we’re going to take you down to the river like Elijah did but our God is a witness of what you say and what you claim. If you’re willing to offer your life, he’s willing to take it,” Min. Farrakhan continued. 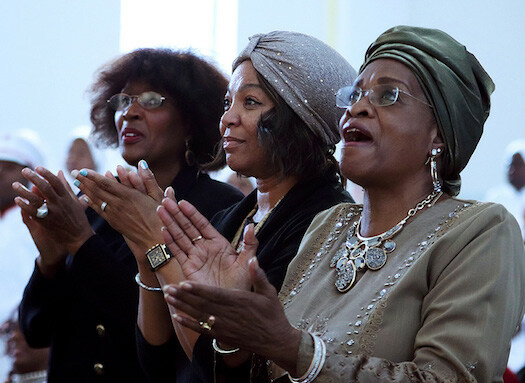 During the program, he touted the young scholars of the Nation of Islam and his research team for uncovering and revealing through the historic writings of Jewish academics, sages and rabbis, the inordinate influence, power and control Jews have exercised in the Black community from slavery through today. He also exposed the origins of the White race based on the teachings of Elijah Muhammad. White people are not natural people on our planet, explained Min. Farrakhan. “See, if you were natural, you would be a native. The native Palestinians are Semitic people; been in Palestine for thousands of years. But this that crept out of Europe, stealing the birthright of the Semitic Jews, the Semitic Arabs, he’s against the Palestinians; they’re Semitic people. Well, where is the real anti-Semite,” he pointed out. 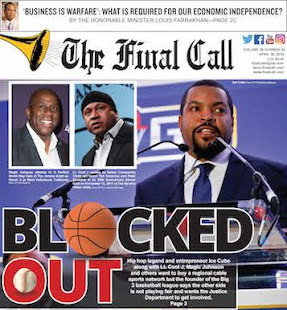 “We have fine teachers, some sitting here, some over there, some couldn’t make it here today, but I’m calling for my enemies—I’d like to get Don King to promote it—a showdown at Madison Square Garden,” the Minister said referring to the boxing promoter and businessman. “A showdown! Why not? We’re ready to die for what we believe! So, come on out Mr. (Jonathan) Greenblatt of the ADL and bring Mr. (Abraham) Foxman with you. Come on out Alan Dershowitz. You that say we are haters and anti-Semites,” thundered Min. Farrakhan. The Anti-Defamation League (ADL) and Mr. Greenblatt (CEO/National Director) and Mr. Foxman (former National Director) and attorney and former Harvard Law professor Dershowitz have obsessively targeted the Minister for years in futile efforts to discredit him with the false label of anti-Semitism and demanding that Black leadership condemn him. 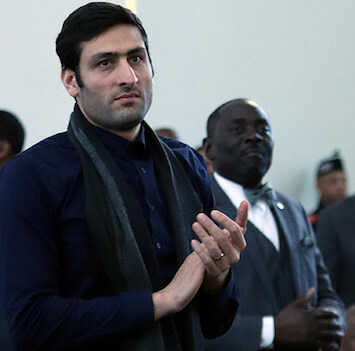 Capacity crowd fills Mosque Maryam at Nation of Islam headquarters of being an anti-Semite. “Come on out from your hiding place. Leave your n**gers at home! Come on out! 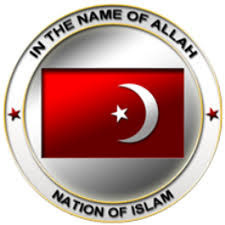 You think that the Nation is only Louis Farrakhan? You think that I’m the only one that can battle this enemy and beat him down? We’ve got stars here!” the Minister thundered as the audience stood, clapped and cheered. “Come on out, since you love to say we are the haters, come on out and prove it,” he challenged. Min. Farrakhan held up several books written by the Honorable Elijah Muhammad including Message to the Black Man, The Fall of America and others, telling the audience the guidance and programs contained in the writings would be a basis for debate with those who oppose him. The trio of books by the NOI Research Department: The Secret Relationship Between Blacks and Jews, volumes one, two and three was a response, the Minister explained, to the unfounded attacks on him by Jews. “Now these books got us in a lot of trouble. Our research department got so angry with White folks calling us anti-Semites, they went and researched the history of the Jewish relationship with us. Not all Jews, but those that have exploited us to our disadvantage and to their advantage,” said Min. Farrakhan. 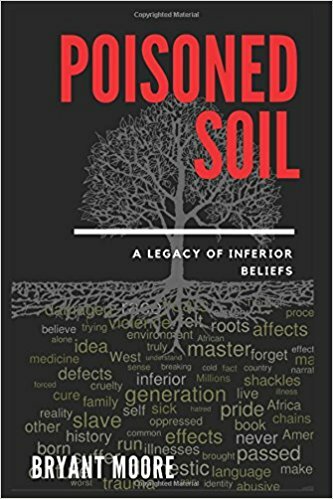 “If you really want to know why they’re so hateful of us, it’s because these books expose their wickedness in dealing with us.” Despite death threats and threats of violence spewed toward Min. Farrakhan, there is no record of any member of the NOI under his leadership harming any Jewish person or attacking a synagogue. “They talked about a 67 percent increase in anti-Semitism and you can’t find one that is a follower of the Honorable Elijah Muhammad under my leadership that has done anything to Jewish people so how could we be the haters?” asked Min. Farrakhan. “I want to tell you why I went,” Min. 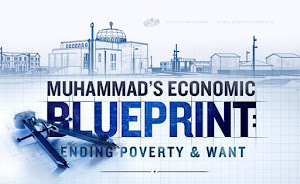 Farrakhan stated as he explained an important aspect of the history of Prophet Muhammad. “Before the Prophet, Peace be upon him—and I’m speaking of Muhammad ibn Abdullah—before he passed of this earth, he said to the Muslims, there is no superiority of the White over the Black. He said there is no superiority of the Black over the White. The one that is most careful of his or her duty to Allah, that’s the best among you,” he continued. In our 400-year sojourn in America, Blacks have been underfoot, and some White or light-skinned people think that Black people are born to be under the foot of others. God allowed the White man to put Blacks in a condition that only God himself could get us out of, explained Min. Farrakhan. The country of Iran is predominantly Shia and this school of Islamic thought is looking for the Mahdi, or Self-Guided One/Son of Man who is prophesied to come from the East and will set down tyrants and establish a new world government of righteousness and peace. “God allowed a condition to be set up with a country that nobody could sit down and a people that nobody could raise up but he came by himself. He came to raise us up and to bring our enemies down,” said the Minister. The 85-year-old world leader shared that he originally did not want to go on the trip based on how he was treated last time he was in Iran but that he prayed to Allah (God) on the airplane and received confirmation from his prayer that he was in the right place at the right time, just as Prophet Muhammad delivered messages to the rulers of various nations 1,400 years ago. 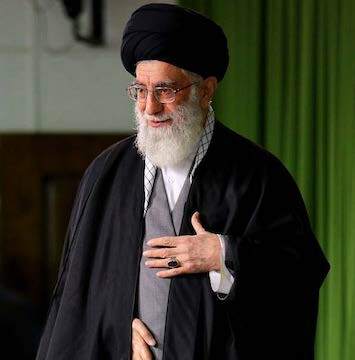 Iran’s Supreme Leader, Ayatollah Ali Khamenei, the highest ranking official in the country. He met with Min. 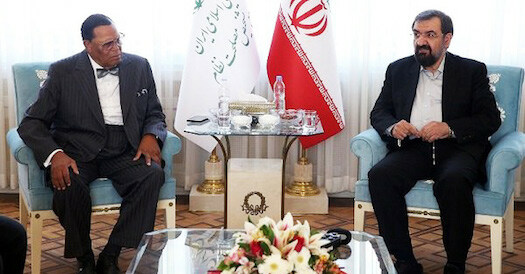 Farrakhan recently in Iran. Leaving no stone unturned, he spoke boldly and unapologetically to Iranian leaders that the Mahdi, Master Fard Muhammad visited Black people in America and raised up a Messenger from among them, Elijah Muhammad. The Minister met with Iran’s Supreme Leader, Ayatollah Ali Khamenei, the highest-ranking official in the country who serves a lifetime term of office. In detail, Min. 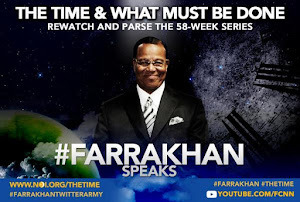 Farrakhan shared how he explained who Master Fard Muhammad is, his origin and mission among Black people in America and what he taught Elijah Muhammad about the planets and the dreadful looking human-built planet in the sky designed to destroy America. Imam Sultan Rahman Muhammad, national imam of the Nation of Islam and great-grandson of Elijah Muhammad, was part of the delegation that accompanied Min. 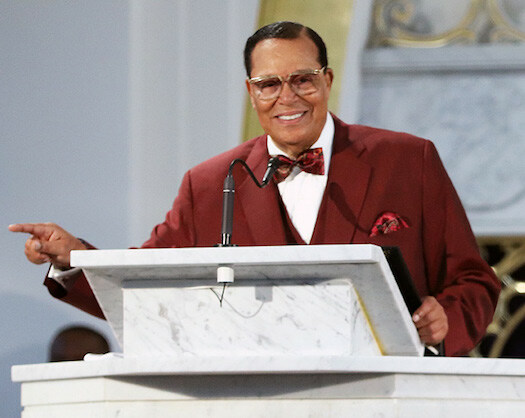 Farrakhan to Iran. “Many of our Muslim brothers and sisters from around the world have seen us (Nation of Islam) as strange in that we have come up in the belly of Satan’s world and Allah has granted by his grace one to be raised from us who would lead us into the straight path of Allah at a time when the Muslim world and its leaders and scholars have deviated from the right path,” said Imam Sultan Muhammad. Minister Louis Farrakhan, of the Nation of Islam, meets with Mohsen Rezaee, secretary of Iran's Expediency Discernment Council in Tehran. The council is part of the legislative branch of the Iranian government. Mohamad Yazdanpanah and his wife Safa Emam are from Iran but currently live in Baltimore. Both attended the Nov. 18 program. 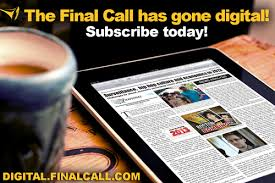 Mr. Yazdanpanah told The Final Call he recently became familiar with Min. Farrakhan through online videos. Muslim women at Mosque Maryam Nov. 18 in Chicago. “I only know him for three days, not even three. My wife is right there so she knows. God is my witness as well. ... I had heard of Minister Farrakhan before, I heard of Elijah Muhammad before but the Honorable Minister Louis Farrakhan only two days,” he said. Not everybody gets the chance to go and see the Supreme Leader face-to-face, his wife added. 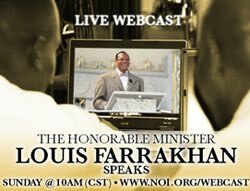 “Even though it’s not necessarily a privilege because as Brother (Farrakhan) mentions there are flaws, including in Iran even though our government of Iran is trying to take a stand against tyranny and oppression. But there are flaws and brother mentioned a few of them so it’s not necessarily a privilege to meet him but it’s something very special; there’s no doubt,” said Mr. Yazdanpanah.